Mario Bava's contribution to the peblum genre (Italy's sword-and-sandal fantasy films) should not be underestimated. While the genre started long before Bava made his entrance (peblum films can be identified as far back as the silent era), the genre as we know it today was created in the late '50s when Steve Reeves starred in Hercules and Hercules Unchained. Significantly, Mario Bava served as the cinematographer for both these films, as well as two other significant peblum films, Giant of Marathon and The White Warrior (both starring, once again, Mr. Universe Steve Reeves). So it was only a matter of time before Bava directed his own peblum film. Bava received the call in 1961. 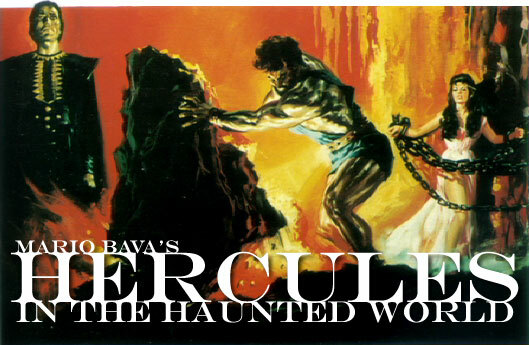 Hercules in the Haunted World isn't necessarily one of Bava's better movies. It's beset by severe limitations wrought by the movie's miniscule budget. Particularly embarrassing is a rock monster - clearly a man in a suit covered with blocks of foam, sort of like a chunky version of Gumby. And it's in this movie that Bava's affection for colored gels reaches absurd degrees: Bava tried to fill all the empty spaces with colored light (and the production has many blank sound stage walls in the background). The results remind me of those rotating colored lights popular back in the '60s for illuminating aluminum Christmas trees. In this movie, Bava shows a love of primary colors and he bathes his film with them. The results are frequently … well … ludicrous. But while it's easy to make fun Hercules in the Haunted World, Bava also fills the movie with many images that do indeed impress, such as Hercules' encounter with a maiden chained to a tree and beckoning for assistance or Hercules' encounter with several undead creatures who rise from their graves and attack our hero. Once you get past the minimalist sets and get into the spirit of this endeavor (not necessarily an easy task for the uninitiated), there are plenty of visual delights to behold. In fact, this film is chock full of wonderful compositions. And therefore it's very important to view this movie in a clean, pristine transfer. Until now, though, that was very difficult. Video versions were available, from companies such as Sinister Cinema, but the soft images and faded prints hardly did the movie justice. However, now Fantoma has released Hercules in the Haunted World on DVD in a beautiful new digital widescreen transfer (2.35:1) that has been enhanced for 16x9 televisions. (Their print is actually titled "Hercules at the Center of the Earth.") Previously, I'd only seen Hercules in the Haunted World by way of battered television prints and fuzzy, poorly-mastered VHS copies, and I'd never really appreciated this movie. Fantoma's DVD is a revelation. It's filled with colorful action and imaginative sets. This is arguably Bava's most fanciful and fantastic movie. Even while Bava worked with a small budget, he had the services of the great Christopher Lee as the main heavy. Unfortunately, neither the English language version or the Italian language version (Fantoma's disc contains both English and Italian audio tracks) feature Lee's own voice. Italian productions frequently encountered problems like this one. It was the result of the Italian film industry's penchant for filming without audio and then dubbing all voices later. Sometimes actors were available for the filming but not available for the dubbing. So you can't blame Fantoma because the movie lacks Lee's own voice. But it's somewhat disappointing nonetheless. Overall, this is a marvelous DVD release, one of the best ever from Fantoma. The disc's special features include a theatrical trailer, a gallery of stills and poster art, and liner notes by Tim Lucas of Video Watchdog. Hercules in the Haunted World is now available on DVD from Fantoma Films in a new digital widescreen trasfer (2.35:1) that has been enhanced for 16x9 televisions. This is the original European cut. The title as displayed on the movie print is "Hercules at the Center of the Earth." The disc contains two audio tracks -- English and Italian -- and optional English subtitles. Special features include a theatrical trailer, a gallery of rare stills and poster art, and liner notes by Tim Lucas of Video Watchdog. Suggested retail price: $29.99. For more information, check out the Fantoma Films Web site. A selection of DVD reviews and articles: The Cinema of Mario Bava.